Like any other religious tradition, Buddhism has undergone a number of different transformations that have led to the emergence of many different Buddhist schools. As the number of members grew, the institutional organization increased its complexity, monks expanded and elaborated both doctrine and disciplinary codes, created new textual genres, developed new forms of disciplines, and eventually divided into a number of different schools. Geographical separation, language difference, doctrinal disagreements, selective patronage, the influence of non-Buddhist schools, loyalties to specific teachers, the absence of a recognized overall authority or unifying organizational structure and specialization by various monastic groups in different segments of Buddhist scriptures are just some examples of factors that contributed to sectarian fragmentation. Three months after the passing of Gautama Buddha, The First Council was held at Rajagaha by his immediate disciples who had attained Arahantship (Enlightenment). Maha Kassapa, the most respected and elderly monk, presided at the Council. The Dhamma and the Vinaya were recited at the First Council. All Arahants unanimously agree that no disciplinary rule laid down by the Buddha should be changed, and no new ones should be introduced. At this point, no conflict about what the Buddha taught is known to have occurred, so the teachings were divided into various parts and each was assigned to an elder and his pupils to commit to memory. These groups of people often cross-checked with each other to ensure that no omissions or additions were made. At the Second Council, one hundred years later, it was not the dharma that was called into question but the monks’ code of rules or vinaya. This resulted in the formation of the Sthaviravādin and Mahāsānghika schools. Opinions differ on the cause of the split: the Sthaviravādins described their opponents as lax monks who had ceased to follow all the vinaya rules, while the Mahāsānghikas argued that the Buddha had never intended a rigid adherence to all the minor rules. Apart from Pāli sources, an important independent account of this split is found in the Shāriputra-pariprcchā (The Enquiry of Shāriputra), an eclectic text of Indic origin, which differs radically from the received Theravādin version. According to this version, the Mahāsānghikas were not the defeated party, but the conservative party that preserved the original vinaya unchanged against the reformist attempts of the Sthāviras to establish a reorganized and stricter version. However, after this initial division, more were to follow. Schism in early Buddhism was typically not on points of doctrine (orthodoxy), but in the area of practice (orthopraxy). So if two schools shared a vinaya, but were in dispute over doctrinal matters, it was likely that they would continue to practice together. However, if one group disputed the vinaya of another, this would often prevent common practice. In the 3rd century BCE, Theravadin sources state that a Third Council was convened under the patronage of Emperor Ashoka, but no mention of this council is found in other sources. This council was not recognized by other Buddhist sects. According to the Theravadin account, this Council was convened primarily for the purpose of establishing an official orthodoxy. At the council, small groups raised questions about the specifics of the vinaya and the interpretation of doctrine. The chairman of the council, Moggaliputta Tissa, compiled a book called the Kathavatthu, which was meant to refute these arguments. The council sided with Moggaliputta and his version of Buddhism as orthodox; it was then adopted by Emperor Ashoka as his empire’s official religion. This school of thought was termed Vibhajjavada (Pali), literally «Teaching of Analysis». The version of the scriptures that had been established at the Third Council, including the vinaya, sutta and the abhidhamma commentaries (collectively known as Tripitaka), was taken to Sri Lanka by Emperor Ashoka’s son, the Venerable Mahinda. There it was eventually committed to writing in the Pali language. The Pali Canon remains the only complete set of Nikaya scriptures to survive, although fragments of other versions exist. Whatever might be the truth behind the Theravādin account, it was around the time of Asoka that further divisions began to occur within the Buddhist movement and a number of additional schools emerged, including the Sarvāstivāda and the Sammitīya. All of these early schools of Nikayan Buddhism eventually came to be known collectively as the Eighteen Schools in later sources. Unfortunately, with the exception of the Theravāda, none of early these schools survived beyond the late medieval period by which time several were already long extinct, although a considerable amount of the canonical literature of some of these schools has survived, mainly in Chinese translation. Moreover, the origins of specifically Mahāyāna doctrines may be discerned in the teachings of some of these early schools, in particular in the Mahāsānghika and the Sarvāstivāda. A Fourth Council is said to have been convened by the Kushan emperor Kanishka, around 100 CE at Jalandhar or in Kashmir, although it seems to have been primarily a Sarvāstivāda affair. For this reason, Theravāda Buddhism does not recognize the authenticity of this council, and sometimes they call it the “council of heretical monks”. It is said that Kanishka gathered 500 monks, headed by Vasumitra, primarily, it seems, to compile extensive commentaries on the Abhidharma, although it is possible that some editorial work was carried out upon the canon itself. The main fruit of this Council was the vast commentary known as the Mahā-Vibhāshā («Great Exegesis»), an extensive compendium and reference work on a portion of the Sarvāstivādin Abhidharma. Scholars believe that it was also around this time that a significant change was made in the language of the Sarvāstivādin canon, by converting an earlier Prakrit version into Sanskrit. Although this change was probably effected without significant loss of integrity to the canon, this event was of particular significance since Sanskrit was the learned language of scholars in India, regardless of their specific religious or philosophical allegiance, thus enabling a far wider audience to gain access to Buddhist ideas and practices. For this reason, all major Buddhist scholars in India thereafter wrote their commentaries and treatises in Sanskrit. During and after the 2nd century explicitly Mahayana philosophies were defined in the works of Nagarjuna, Asanga, Shantideva, Ashvagosha, and Vasubandhu. Around the 1st century, Buddhism spread from India through successive waves of merchants and pilgrims. It reached as far as Turkmenistan and Arabia to the west, and eastward to southeast Asia, where the first records of Buddhism date from around 400. Mahayana Buddhism established a major regional center in what is today Afghanistan, and from there it spread to China, Korea, Mongolia, Japan, and Vietnam. In 475, the Indian monk Bodhidharma travelled to China and established the Chan (Chinese; Japanese: Zen), school. During the first millennium, monks from China such as Faxian, Yijing and Xuanzang made pilgrimages to India and wrote accounts of their travels when they returned home. These Chinese travel records constitute extremely valuable sources for information concerning the state of Buddhism in India during the early medieval period. At one time, different Turkic and Tocharian groups along the northern fringe of East Turkestan (modern Xinjiang in western China) adhered to Nikaya Buddhism. However, Buddhism there was supplanted by the introduction of Islam around 1000. Vajrayana also evolved at this stage, carried from India to Tibet from around 800 by teachers such as Padmasambhava and Atisha (who also studied in Srivijaya before teaching in Tibet). There it initially coexisted with native belief systems such as Bön, but later came to largely supplant or absorb them. 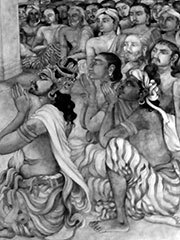 Vajarayana was also practiced in Java where King Kertanagara of Singhasari was a noted exponent. An early form of esoteric Vajrayana known as Shingon was also transmitted by the priest Kūkai to Japan, where it continues to be practiced. There is still an active debate as to whether or not Tantrism was initially developed within Buddhism or Hinduism. Buddhist literature tends to predate the later puranic Tantras, and there is some evidence to suggest that the basic structure of tantra depends upon the Mahayana Buddhist philosophical schools. However, it is thought by others that meditative Shiva sects seem to have existed from pre-Vedic times; also, from scriptural citations and study of the Vedas, some say Tantra saw its philosophical basis in the mystical rites and mantras of the Atharva Veda (and later the Upanishads and Mahayana school of Buddhism).